Category: $2,001 - $5,000, Feature Greenhouses On Sale, Free Standing Greenhouses, Pacific Series, Pacific Series - On Sale, Twin Wall Polycarbonate Greenhousese, More.. This Pacific Series polycarbonate greenhouse with its appealing curved eaves is one of our best buys. The 6mm double Twin Wall polycarbonate efficiently traps heat that is produced by the sun insulating it against the cold. The light transmission is 85%, and sunlight is diffused allowing even more growing! Polycarbonate also minimizes against interior condensation. This greenhouse is one of our top sellers and is considered our top Best Buy! It has been designed and constructed to the highest engineering standards for over 50 years! 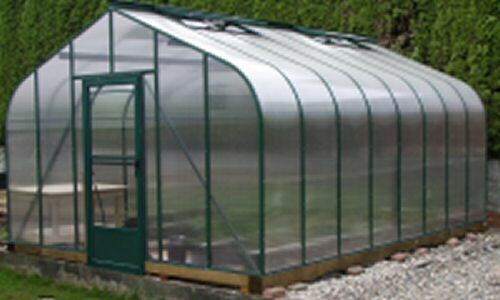 Add on the attractive Victorian Trim Package to enhance the charm and elegance of your polycarbonate greenhouse. Your Victorian Trim Package can be selected in the Options Box below. Photo shown may not be actual size.